An A-10 Thunderbolt IIs with the 74th Fighter Squadron from Moody Air Force Base, Ga., flies over the Gulf of Mexico Feb. 7 during Combat Hammer. The 86th Fighter Weapons Squadron’s Combat Hammer is a weapons system evaluation program at Eglin Air Force Base, Fla. 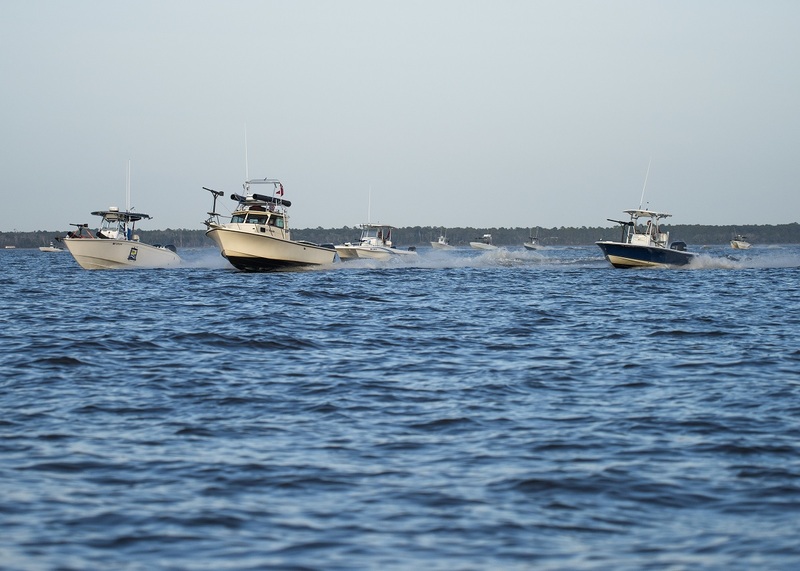 Fishing boats equipped with makeshift machine guns and weapons to resemble ‘pirate boats’ invaded the area by the Midbay Bridge between Niceville and Destin Feb. 6. This was a scene from Combat Hammer, the 86th Fighter Weapons Squadron’s (FWS) annual multi-service exercise to evaluate weapons systems. 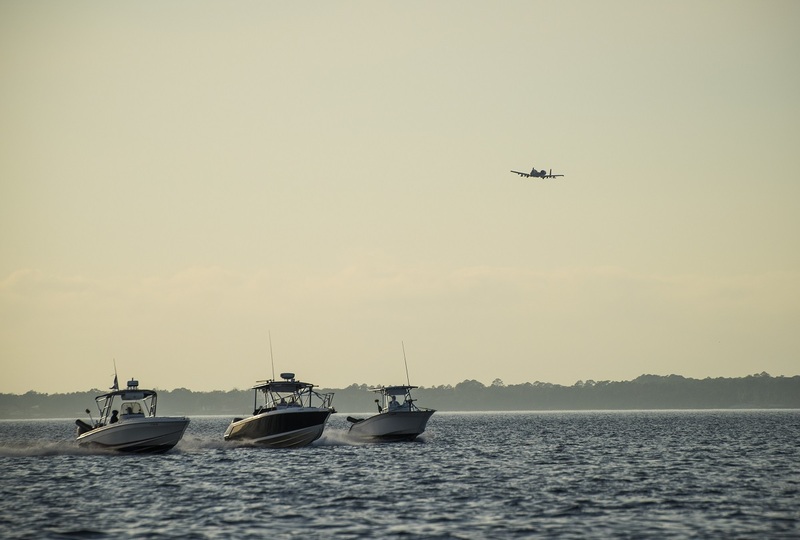 Local boat captains and mariners operate fishing boats equipped with makeshift guns and weapons invaded the Choctawatchee Bay area Feb. 6 during the 86th Fighter Weapons Squadron exercise, Combat Hammer. The boat swarms helped create a realistic environment to provide exercise participants an opportunity to train like they fight. 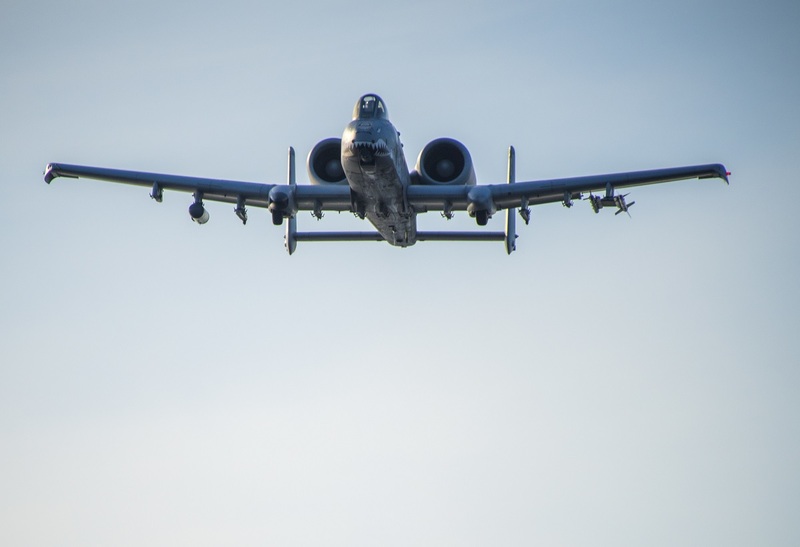 To make training more realistic, A-10 pilots shot inert 30 millimeter training rounds at unmanned boats positioned in the Gulf of Mexico during the morning portion of evaluation. The pilots also fired AGM-65 ‘Maverick’ missiles, inert 2,000 pound Guided Bomb Unit-10s, 500-pound GBU-12 laser guided bombs, and GBU-54 laser-guided Joint Direct Attack Munitions (JDAMs). During the training week over 62 bomb drops were made over the Eglin range. The data gathered from those drops is captured by 96th Range Group units. The 96th Range Control Squadron (RNCS) provides real-time mission control and data analysis capabilities for the Weapon System Evaluation Program (WSEP) exercise within Eglin’s Central Control Facility (CCF). 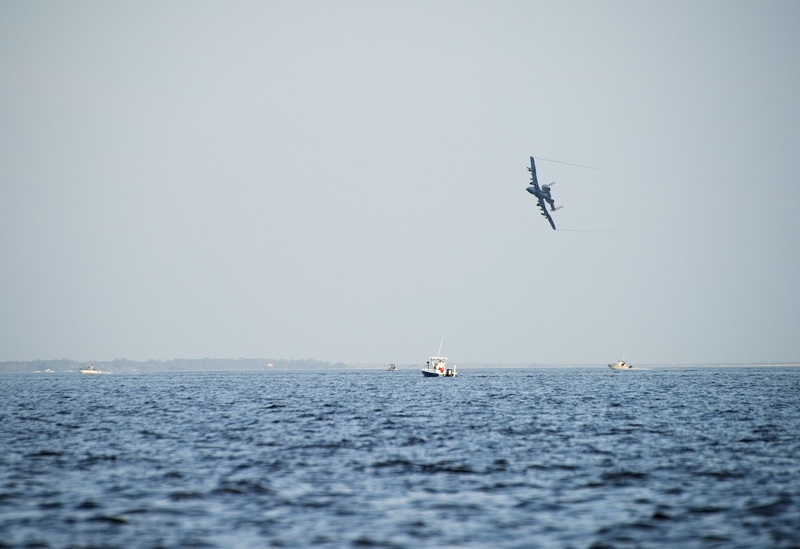 Local boat captains and mariners operate fishing boats equipped with makeshift guns and weapons invaded the Choctawatchee Bay area Feb. 6 during the 86th Fighter Weapons Squadron exercise, Combat Hammer. Telemetry kits mounted on munitions provide digital data streams captured by ground telemetry sites operated by the 96th RNCS. This data is then transported to the 96th RNCS CCF by fiber optic cable and translated into information (such as targeting coordinates) the WSEP customer can then analyze. The 96th RNSS also provides high speed cameras and radar data to the CCF to increase situational awareness. “At the end of the exercise, we package all of the mission data and deliver it to the WSEP customer. In a nutshell, we provide WSEP with decision quality data, so they can ensure the employment of the weapons work as intended before they go downrange,” said Pitchford. This data measures whether or not the weapons are suitable, reliable, accurate, and if they can be maintained. Those findings are broken down by analysts and briefed to senior level Air Force leaders, combatant commanders and operational planners to aid them with warfighter capability decisions. In addition, the data is used to support funding, training requests, hardware and software when munition deficiencies are identified. The identification of deficiencies allows the Air Force to correct any issues within the Air Force inventory before the weapons are deployed to operational areas of concern, according to Neitzke. The evaluation exercise also provides and enhances operationally realistic training for the squadron’s pilots, maintainers and the participating units. 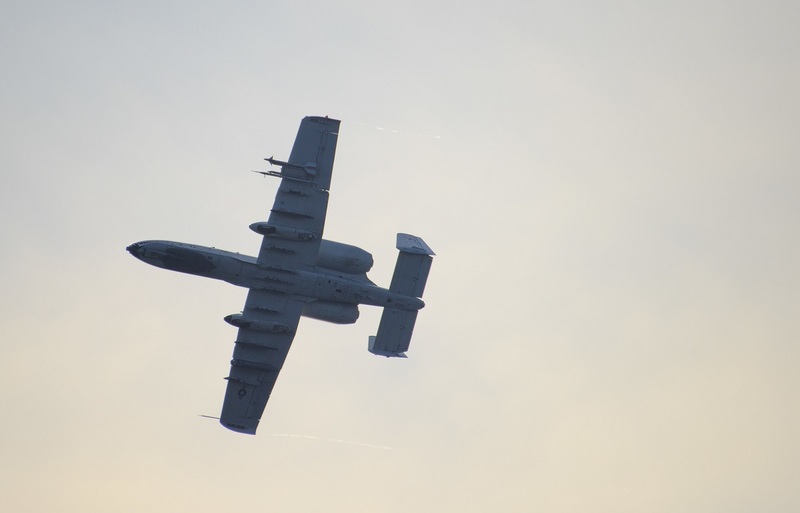 An A-10 Thunderbolt IIs with the 74th Fighter Squadron from Moody Air Force Base, Ga., flies over the Gulf of Mexico Feb. 7 during Combat Hammer. Many times, Combat Hammer is the first time aircrew members get to release a specific type of munition from their aircraft. The goal is to provide pilots without weapons firing experience the chance to get in the cockpit and drop a new weapon, or to drop a weapon normally not found at their home base. From the time the munitions are assembled, to when they strike their targets, the 86th FWS’s Airmen evaluate every aspect to ensure the munition can be pulled off the rack and employed effectively tomorrow in combat.